In her memoir, she weaves together research, history and interviews. Such democratic zeal is exactly what one wants from a narrator who munches her way up and down the Maine coast. Along the way, Christensen meets some of the people who have made it their life’s work to catch, grow and capture the distinctive flavors of the region. “How to Cook a Moose: A Culinary Memoir” is a celebration of Maine’s food and the people behind it. The book is at once a road trip, farm tour and love story. (Its name is a nod to famed food writer M.F.K. Fisher’s wartime book, “How to Cook a Wolf.”) The author, who arrived in Maine by way of Berkeley, California (her birthplace), and New York City (her home of some 20 years), is on a mission. She fell in love with a New Englander, Brendan, now her fiancé, and together they moved to Portland. She fell equally hard for the place – the rugged shoreline, the welcoming community of writers, the bounty of Portland’s restaurants (537, at last count) and, of course, the briny, sweet, earthy flavors that abound. Christensen serves as both author and journalist here, interviewing farmers, foragers and entrepreneurs. Her portraits of these enterprising stalwarts, legends and newcomers alike, are the book’s forte. She meets Eliot Coleman, of Four Season Farm in Harborside, a pioneer of organic farming. She chronicles the story of Leigh Kellis’ Holy Donut in Portland, a coffee-and-donut shop that is a paradigm of Maine’s small-scale home-grown excellence. She visits the Lost Kitchen in Freedom, where chef-owner Erin French leads a staff who farm by day and cook by night, and where French herself built the tables of barn board. One message resounds from all of these encounters: Signs of Maine’s do-it-yourself culture are everywhere, and the results are inspiring. The author’s travels bear fruit on several fronts. Christensen leaves some of these visits with freshly picked produce and other goodies, which she and Brendan prepare at home. Back in their newly renovated Portland kitchen, the author and her fiancé delight in the pleasures of their eco-loco-sustainable diet. Cooking and eating are central to their world; something is always simmering on the stove, and their conversation meanders happily around food. Recipes complement each chapter of the book, including more ways to cook moose (think steak) than most of us knew existed. Readers of Christensen’s 2013 memoir, “Blue Plate Special,” will find a calmer version of the author this time around. Snug and content in her new life, Christensen lacks the edginess that pervaded the earlier book. On balance, this suits the new memoir well. Irrepressible as ever, Christensen is more narrator than centerpiece here, on a quest to uncover the true Maine spirit. Her interweaving of research, history and interviews works to good effect. 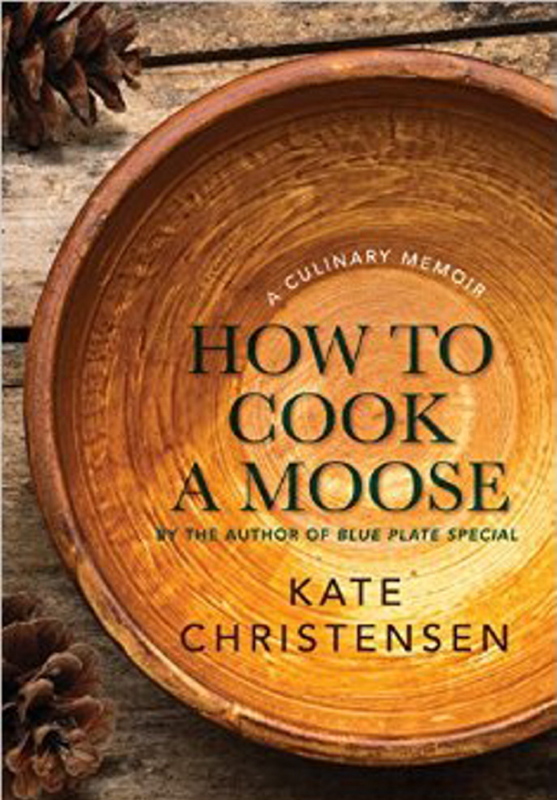 “How To Cook A Moose” conveys the sense of struggle that all Mainers face by virtue of the harsh climate. “How many marriages up here have ended in divorce as a result of all the winter’s many seasons and their ensuing challenges?” Christensen asks. She then proceeds to enumerate Maine’s 10 seasons – most of them variants of winter. Still, the author has embraced her newly adopted home in all of its guises. At bottom, this book is a mash note to Maine, to the grit and inventiveness of its people. Of course, the native blueberries, lobster, potatoes and moose deserve a piece of the credit, too.